For Day 3, we went to Trans Studio Mall & Theme Park. Click HERE to view. After Trans Studio, we ventured around Dago area and partake in a 'must-do' while in Bandung-- shopping. At their numerous factory outlets, especially. 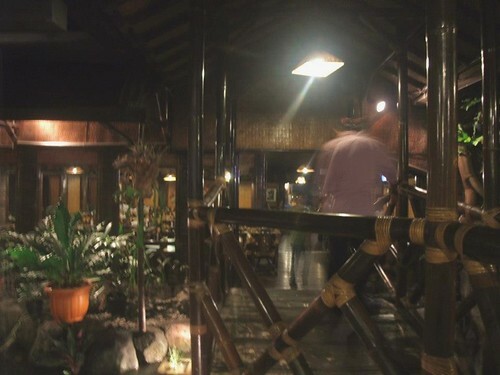 Come evening time, we eventually settled down to have our dinner at Sundanese restaurant that my BiL patronised before and liked. 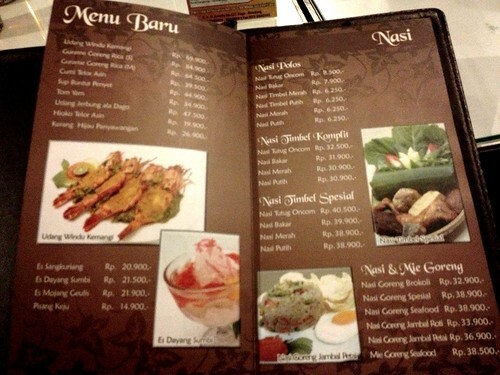 FYI, Bandung is like, THE place to get Sundanese food. Even the Jakarta folks drove up here over the weekend to eat (hence the traffic jams)! 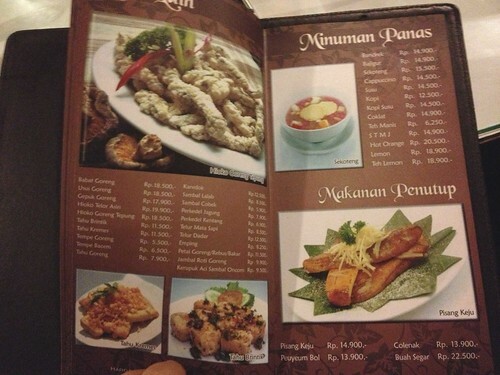 Sundanese restaurants are almost everywhere, here. 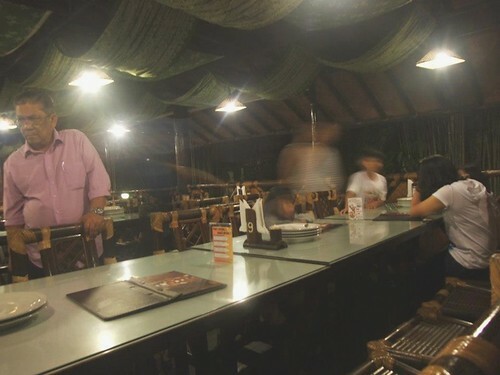 Sunda is a region in West Java and their cuisine is easily defined as 'fresh, simple and clear taste'. In my own words, the food is more often than not; sweet. Famous Indonesian restaurants in Singapore that serve Sundanese cuisine are Gurame, Desa Kartika and of course House of Sundanese. 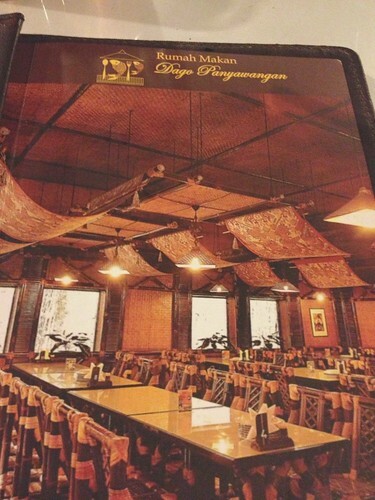 Rumah makan Dago Panyawangan is located right smack where the fashion outlets and hotels are located. Yes, a tad 'touristy' but we are after all, tourists, aren't we? First and formost, I have to apologise for the poor qualities of the pics. I was busy handling my kid and wrongly chose the wrong mode on my camera dial. Hence, most pics appear to be off-focus and overly saturated. And my poor camera was already spoilt, hence we can't re-view the pics on the LCD screen. Pfft. My BiL was laughing away when he saw this pic. "Poor chicken! The legs in a split like that!" Ok, ok… 'Ayam Serundeng' appear to be a dish of fried chicken that's served with crispy, fried spices that are in shredded form. The spices are made of (usually) shallot, garlic, cumin, galangal, bay leaf, lemongrass, tamarind and dessicated coconut. The large or leafy items had to be thinly sliced or chopped up so that they will turn crispy when fried and then served with the fried chicken. 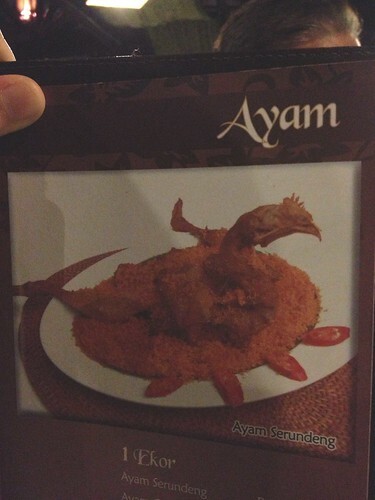 I've had this dish numerous times, be it in Sundanese restaurants here or even home-made by my Indonesian relatives. It's awesome..! The restaurant is huge and has many sections. 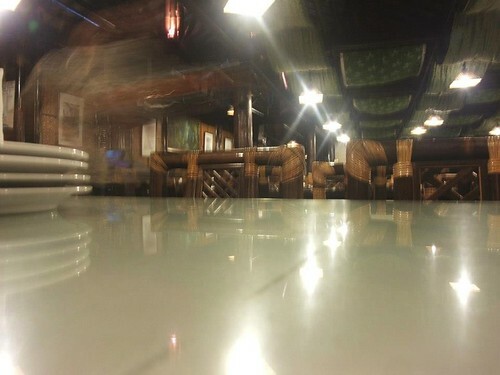 There's a sizable dining area up front, close to the entrance. I think that section is meant for smaller clusters of diners. Pretty cosy. 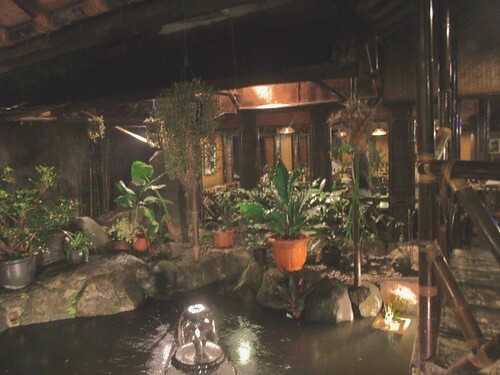 Then there's a fish pond in the middle and we need to cross a bridge to get to another bigger dining hall (where the kitchen also is). Seems like this is where they accomodate large groups (tour entourage, perhaps?) Rows after rows of long tables. We dined in this section. Hmm... I think I need to separate the food pics into another post. Coming soon!